External hard drives are slowly going away. Every day – flash drives get more powerful, provide more storage space and get more affordable! While there are cloud options for storing your data, there are no guarantees it won’t get lost or stolen. With USB flash drives you can rest assure your data is only accessibly by you and is always available without the need for internet connection. Now you’d probably like your stuff organized and this is where memory thumb flash USB drive organizer box comes in! It’s a convenient box with carry handle and a closing lid where your USB flash drives can be stored securely, protecting the USB connector tips and overall protection from dust in a transparent box! In fact you can also store SD cards (all sizes), small PC peripherals and whatever small electronics which will fit - will bit protected! Secure Anti-Static Foam - Large size - 24 slots! Portable (Length: 12", Width: 4", Height: 3.75"), convenient storage case with lid and carry handle! 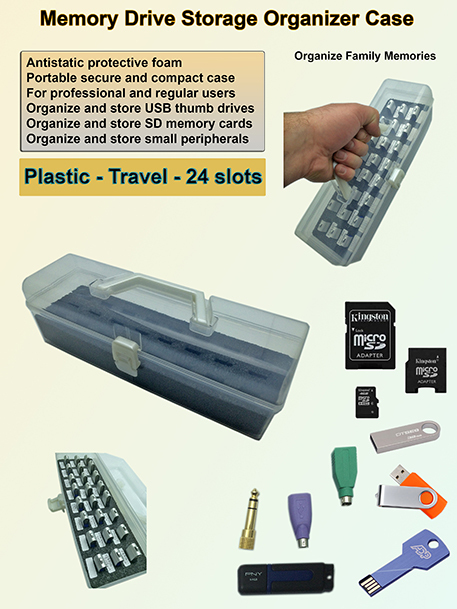 Organize and store USB thumb drives, SD memory cards, small computer | audio and electronics peripherals! Multi-Purpose storage: variou sizes USB flash drives, SD full/mini/micro memory cards, PS2-USB adapters, audio adapters, small parts, etc. !